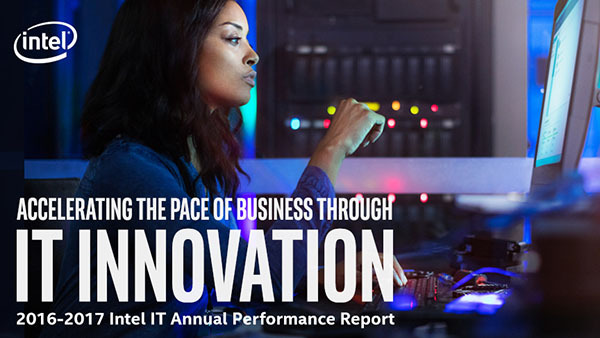 Intel IT Annual Performance Report: Intel IT plays a pivotal role in providing the solutions and services that are accelerating Intel’s digital transformation. In this report, Intel IT describes transforming how Intel’s businesses run and grow, advancing Intel’s products and services in the market, increasing workforce productivity, strengthening Intel’s security culture, and promoting an engaged and innovative workforce. New and exciting opportunities exist for IT to continue to accelerate Intel’s transformation by optimizing our end-to-end business processes through key digital technologies and platforms. Intel IT contributed significantly to Intel’s record USD 59.5 billion in revenue in 2016; in 2017, we will continue to raise the bar for Intel IT to provide better leadership in driving innovation, operational improvements, and workforce productivity that will unlock more business growth for Intel. By sharing Intel IT’s digital transformation storyour successes, challenges, and plans for improvement, we aim to help other business leaders and IT organizations digitally transform their own companies.